A Maine man suspected in an assault in the town of West Gardiner managed to elude police by commandeering a kayak and paddling away, according to this article in the Portland Press Herald. Police then sought assistance by radioing some game wardens who were in a boat nearby. When the wardens approached the suspect mid-lake, he did a wet exit and managed to escape by swimming away! No word on what sort of boat the game wardens were using, but it was evidently slower than a swimming man. According to a slide show on the Washington Post, a group called "Bikes for the World" is collecting used bicyles (bear with me here; I'm not off-topic) in the Washington, DC, area and shipping them to Costa Rica, where, it appears, they're sold to adults and/or donated to kids. The fees that they charge adults -- up to $60, plus finance charges -- seem outrageous, and I really question what this "charity" is about. (I can buy a brand new adult bike at WalMart for about $60 - not a very good one, but new.) 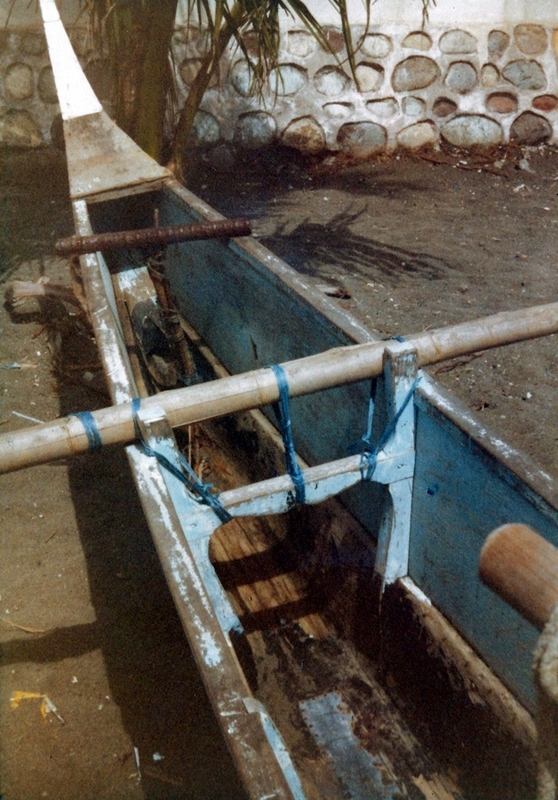 But the slideshow (once you get past the obnoxious Cisco video clip) features a few photos of some fine dugout canoes, still evidently used very functionally by indigenous people in Costa Rica. 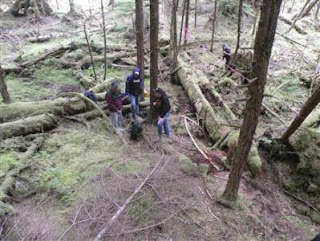 According to an article by Reuters, a large unfinished cedar dugout canoe, thought to be about 500 years old, has been discovered near the village of Kasaan on Alaska's Prince of Wales Island. Inhabited by Haida and Tlingit people, the area is a rainforest, making the survival of such an artifact all the more extraordinary. Thanks to Silvio Antunha for pointing this one out. I shouldn't be blogging this weekend: I should be on a week-long canoe trip on the West Branch of the Penobscot River. 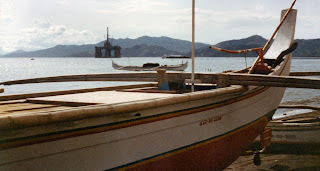 But a bad back forced cancellation of the trip, so instead, while I'm sitting around healing, here's the third of three posts on Philippine bancas, this one concentrating mostly on construction details. (Previous posts on bancas are here and here.) As always, click any image to magnify. 1. This deteriorating banca is clearly of "five-part" canoe construction: a dugout base upon which are attached single side strakes, and large bifurcated stempieces bow and stern to close in the raised sides. 2. 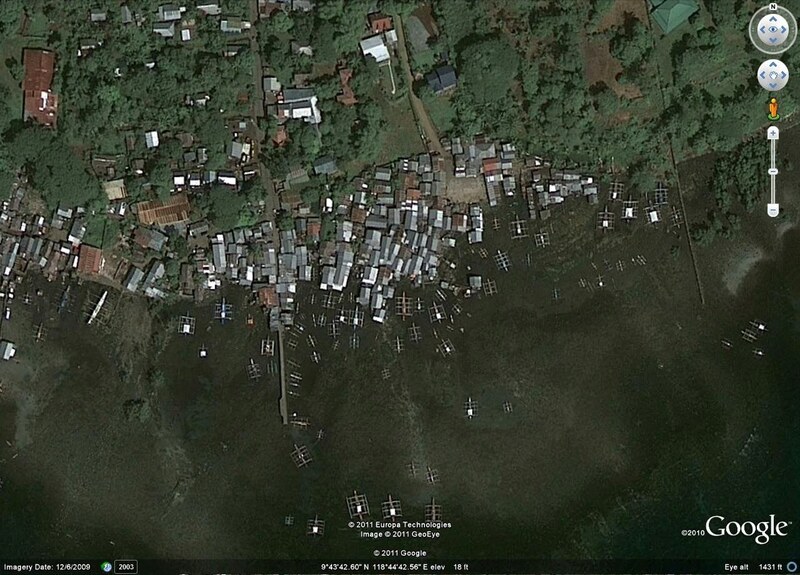 This hull also appears to be built on a dugout base, but it's interesting that it is flat-bottomed. Also note the complex frame-piece that supports the raised sides and provides a mounting/lashing point for the outrigger boom. The lashings appear to be cheap synthetic material. 3. 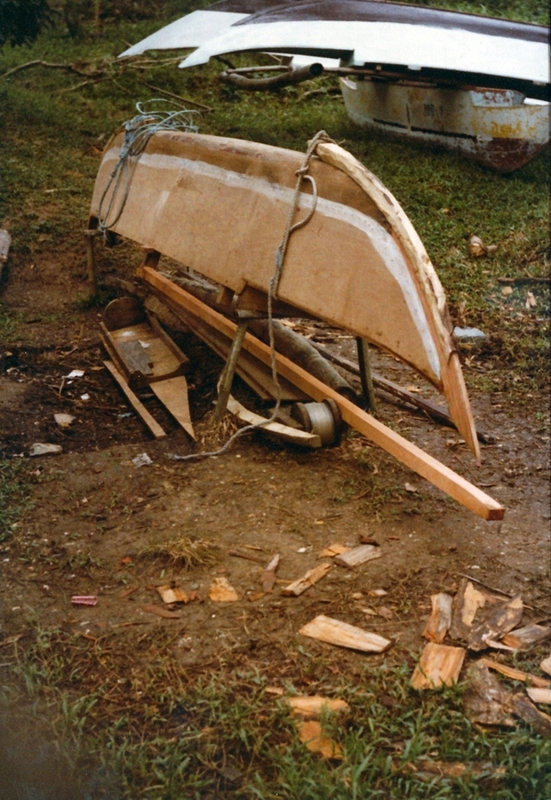 A hull under repair, with one side-piece removed, shows multiple combination frame-thwart assemblies and a stringer that appears to run along a joint between lower and upper side-strakes. Note how the frames bulge around the stringer. 4. Not a construction shot, this one shows a different hull configuration than we've seen before, with very high sides relative to length; a fairly sharp transition between the bottom and the stems; sizable decks fore and aft; and a distinct, well-protected cockpit defined by square-ended coamings all around. With its high freeboard and coamings, this style of hull is intended for use in rougher waters. 5. Massive, roughly-hewn side-strakes are tacked to the outer surfaces of a narrow dugout base. (In photo #1, in contrast, the side-strakes are flush with the upper edge of the dugout base.) The bottom ends of the outer stems are temporarily being held in place by lashings. 6. A trio of newly-built hulls of the deep, coaming-protected type shown in photo #4. The one on the right shows a stringer joining upper and lower strakes, and has a pointed front coaming made up of two pieces. Photos courtesy of Capt. Rob Whitehurst; please do not re-use without permission. This is a continuation of the previous post on the Philippine banca, a wide class of double-outrigger canoes still in general use. 1. 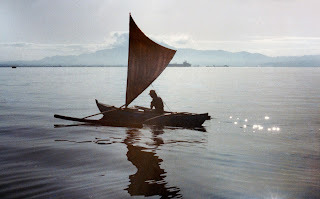 Only small bancas still use sail. This appears to be a standard "oceanic sprit" rig. 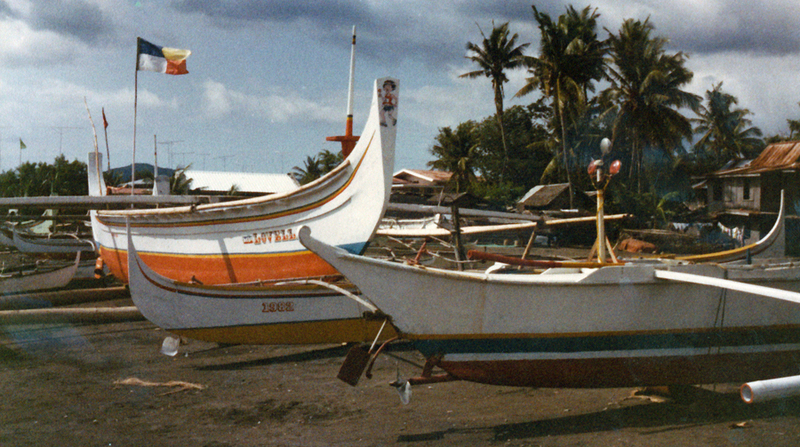 Many of the smaller bancas are used by fishermen. 2. 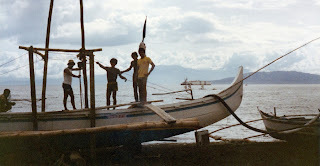 Another fishing boat, but this one large and engine-powered, with a crew of at least 18. 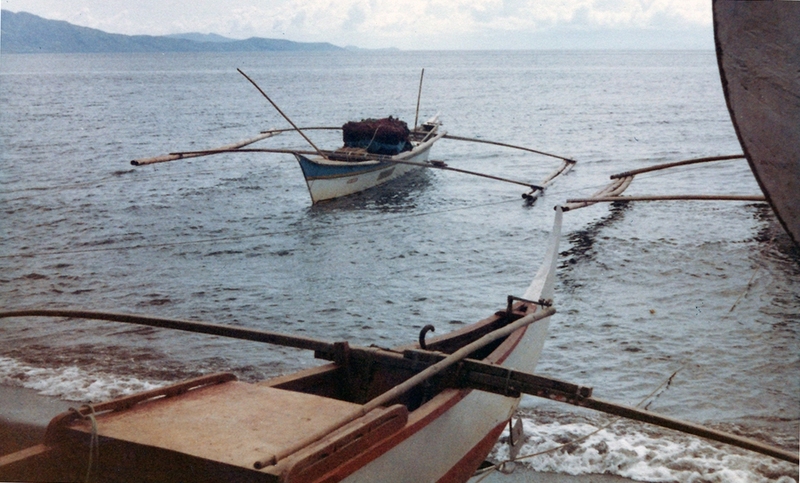 The boat is returning from sea with nets and catch aboard, heading to market. 3. 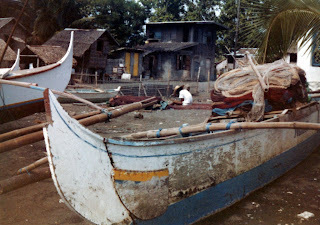 Note how, on the banca in the background, one of the floats is well clear of the water. 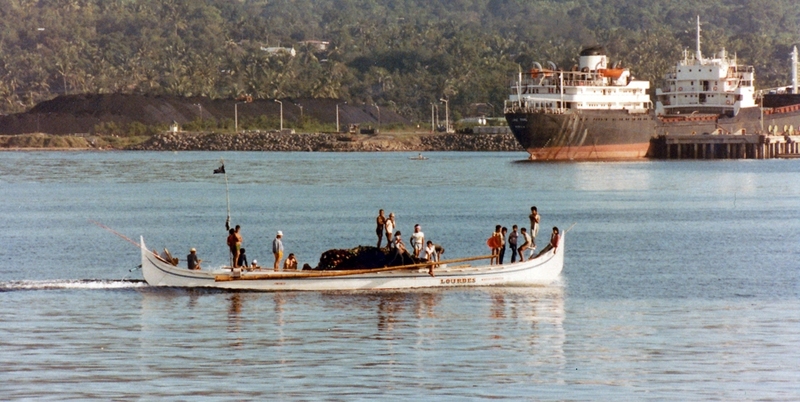 On the foreground boat, note how the long tiller extension allows the helmsman to remain forward of the engine box. 4. 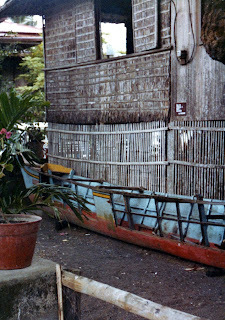 While this boat has distinctly different ends from the one in the preceding photo, the interior arrangements are generally similar. In addition to the long tiller extension and engine box, note the internal frames and thwarts. I presume the lovely raised ends are purely decorative, as they don't appear to lend any weather protection or buoyancy. 5. This large banca has a short pipe tiller, requiring the helmsman to remain aft of the engine box. Contrast the flattened raised stempost here to the narrow one in the previous photo. Note too the very small rudder, and the two-layered outrigger boom..
6. 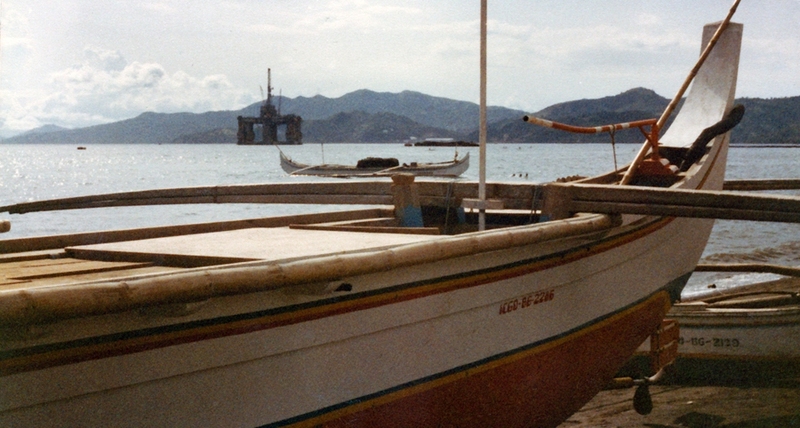 A temporary derrick of bamboo posts has been built around a banca's main hull, and a chain hoist is being used to install or remove the engine. (The shaft is in place, but no propeller is installed.) The outrigger boom is a flat board -- an unusual feature -- and the outrigger float consists of several bamboo stalks in a bundle, not side-by-side as on the boat at the extreme right in photo #3 above. As in the previous post, all photos used here by kind permission of Capt. Rob Whitehurst. No further re-use permitted. Friend and contributor Capt. 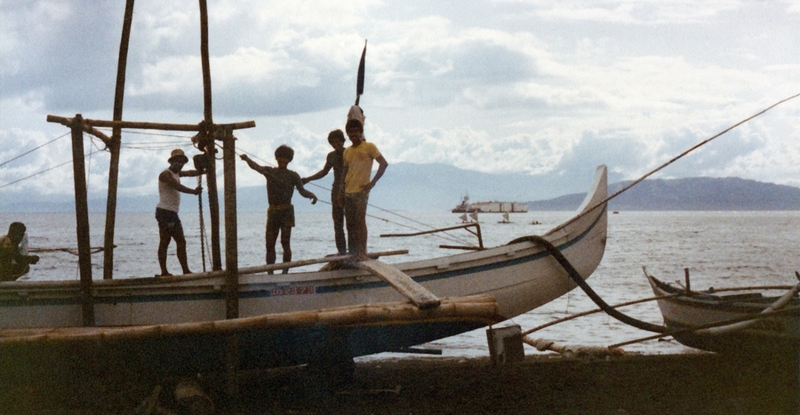 Rob Whitehurst sent me a bunch of photos of Philippine bancas that he shot in the 1980s on both sides of the San Bernardino Strait, which separates the islands of Luzon and Mindoro. 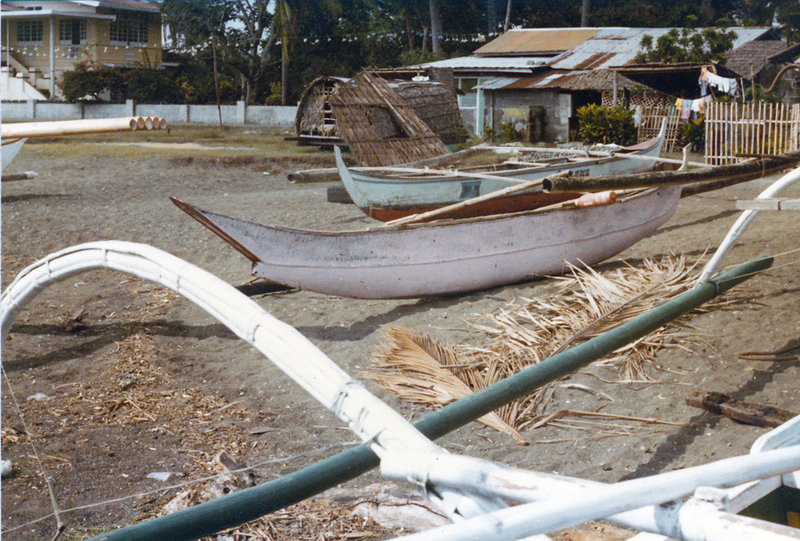 The banca is a double-outrigger canoe. Most have inboard engines, although some of the smaller ones still use sail. 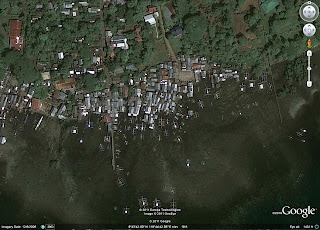 Lest anyone fear that the banca might have disappeared in more recent years, Rob did some searching on Google Earth and provided several satellite photos of the same area, of which one is shown below. As can be easily seen (click the image for an enlarged view), bancas are still quite numerous -- they're the water-bug-like structures floating all along the waterfront. 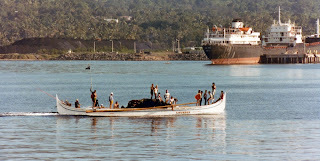 They are used for both cargo and passenger transportation and for fishing. 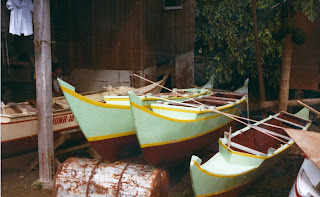 There's much variety apparent in the boats in Rob's photos -- enough to form the basis for at least two blog posts, of which this, the first, will look at general hull and outrigger configurations. A lightly built sailing banca in the shadow of a much larger motor banca. A large motor banca in the background: in addition to its raised, decorated transom end, note the deeply rockered form of its outrigger floats. 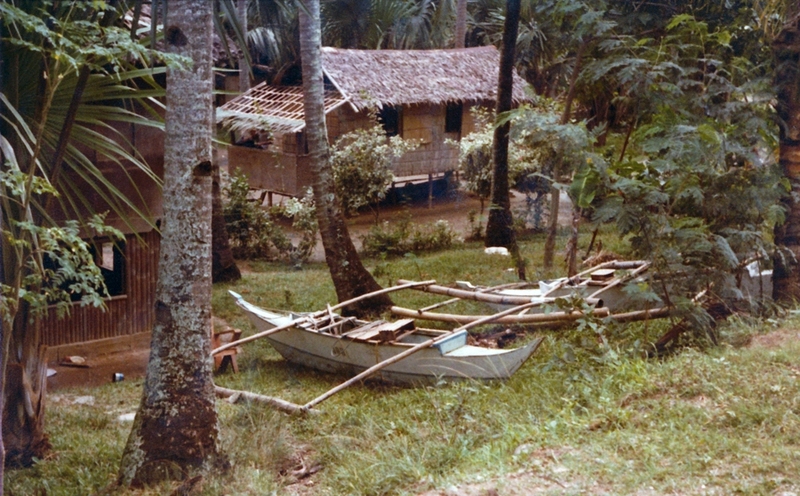 In contrast, the boat in the right foreground has dead-straight outrigger floats and narrow stems. In the boat on the left, note the hull's deep, narrow, flat-bottomed shape. 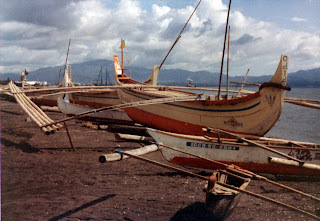 The large banca in the background, apparently round-bottomed, has well built-up stem and stern with nicely curved transitions to the keel line. 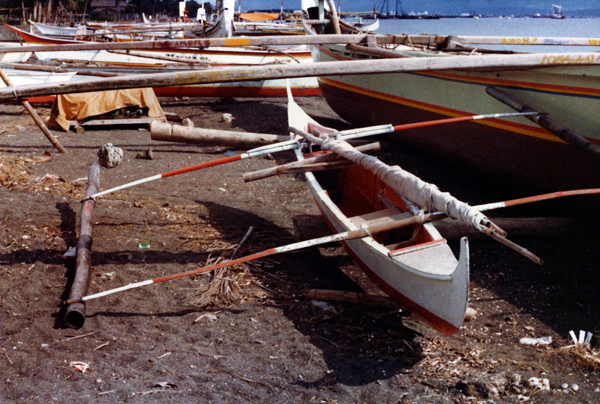 Four lengths of bamboo have been lashed together to provide extra flotation on the outrigger float. 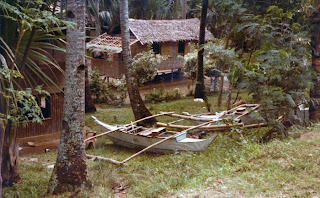 The smaller boat in the foreground appears to use a solid log for its float. The outrigger booms are consistently lightly built. 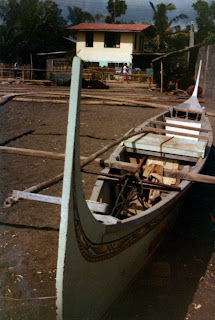 The boat in the far background has slab sides tacked to the upper outside edges of a vestigial dugout base, with false stems added at both ends.. The boat in the middle ground is a deeply-rockered dugout with strakes added carvel-fashion to provide greater freeboard. In the extreme foreground, the curved, multi-part outrigger booms are quite unlike all the other simple straight booms seen elsewhere.